There are so many hours in a day, so why are you wasting your time on tasks you should delegate to other people? 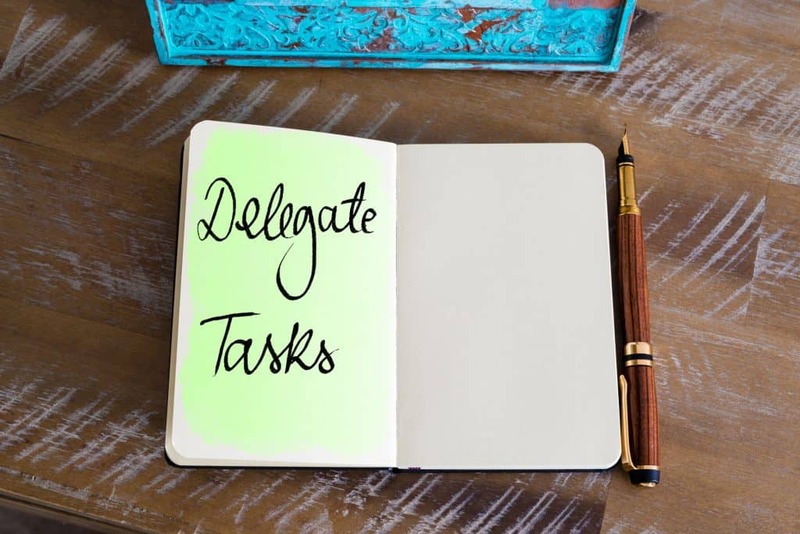 Find out what tasks you should delegate and why in this article! So, you’ve finally taken the leap to start your own company. Congratulations! You may feel tempted to take on all the work yourself. However, doing too much work can be detrimental to your health and your new business. The truth is that there is simply too much work to do it all yourself. Bogging yourself down with tasks you should delegate can take your attention away from the tasks that you actually need to focus on. With every task vital to the success of your company, it can be hard to decide which tasks can be delegated. So how do you decide? Keep reading to discover the 9 tasks you should delegate to others and why. Clerical work is important to keep your new company organized and running. Data entry, ordering office supplies, creating spreadsheets, filing documents, and fielding phone calls are all examples of administrative tasks to delegate. Hiring an office assistant is an easy way to ensure that all this is getting done. Organization and attention to detail are the key traits to look for in a potential office assistant. Once you find one, you won’t need to worry yourself with these tasks. Are they important? Absolutely! Are they tasks that you can only trust yourself with? No. Alright, so you created your own company and built it from the ground up. You’re probably an expert in your field, making you a vital part of the company. You may think that your years of experience have given you the tools to do every task, but everyone has their weaknesses. There are so many aspects to running a business that one person can’t possibly know how to do everything and be a pro at it. Take some time to consider the things you aren’t good at. Whether that be marketing efforts, accounting, or human resources. Then find people in your company with these backgrounds (or hire someone on) and delegate these tasks to them. As the owner and founder of your company, you’re most important job should be ensuring company growth. Successful delegation means that you will be left with plenty of time to brainstorm and work on building your company. It’s important to take the time to find good employees you’ll trust to delegate important tasks to. This way you’ll have less work to worry about, and you’ll feel confident that your employees are doing a good job. Dealing with regulations can be time-consuming, frustrating, and complex. While it’s important to stay up-to-date on various regulations, these are tasks you should delegate to others. Legal regulations, insurance regulations, and tax regulations are all things that your employees should keep an eye on. Instead of trying to stay on top of all these yourself, have your legal department focus on legal regulations and your accounting department look at tax regulations. The more you grow your company, the more tasks you’ll need to delegate. It’s no secret that the largest companies delegate the most tasks. The key is focusing on helping your team grow so they can be there to pick up more tasks or become managers who will then delegate tasks to those below them. While your company is small and still growing, take the time to learn about your employees. Find out their skills and where they’d fit in with the company in the future. Then delegate tasks that will help them grow within the company. This is one of the best ways to create leadership for company growth. Everybody has tasks that they absolutely hate yes, even company founders! But the beauty of founding your own company is that you can delegate boring tasks or tasks that you hate to other people. You’ve worked hard to create a company, and you hired employees to help you run it. So, let them handle the tasks you dread doing. This will free up time to focus on the things you enjoy and be creative. Tedious tasks can be draining and time-consuming. Worse yet, they can make you feel like you don’t have enough time to be creative and brainstorm ways to grow your company. Not only are tedious tasks boring, but they are usually simple. This means that you can delegate boring tasks like this to almost anyone in your company. Instead of wasting large chunks of time transferring files, delegate this to an office assistant or another employee. Chances are that your company will have quite a few large projects to complete. While you may want to be involved in these projects, you might not have to be involved in the beginning steps. Researching and taking care of small, tedious tasks at the beginning of a project can be delegated to other staff members. Once all that is out of the way, you can ask your employees to present their findings and bring you up to speed. Then, you can step in when the project is about to take shape and give your input or take charge. So, we’ve already talked about delegating small, tedious, and clerical tasks. But sometimes we have big tasks that need to be done that are fighting for a spot on our priorities list. In order to achieve successful delegation, you should decide which tasks are actually priorities, and delegate the rest. This way the task will get done on time and you won’t have to stress about having too many big projects to do at once. Starting and growing your own company can be a challenging feat. In order to keep your company running smoothly, you should master the art of delegation. Clerical work, researching regulations, starting large projects might all be vital tasks. However, these are all tasks you should delegate to others. Did you enjoy this article? Check out my startup page for more content like this.